Some natural wonders seem to be alive—as if they have a mind of their own. They seem to choose who should see their majesty, decide when they should reveal their secrets, or determine how they should “test” the mortals to be worthy of entering their domain. It just shows that greater powers are at play here—powers that our feeble minds can never comprehend. 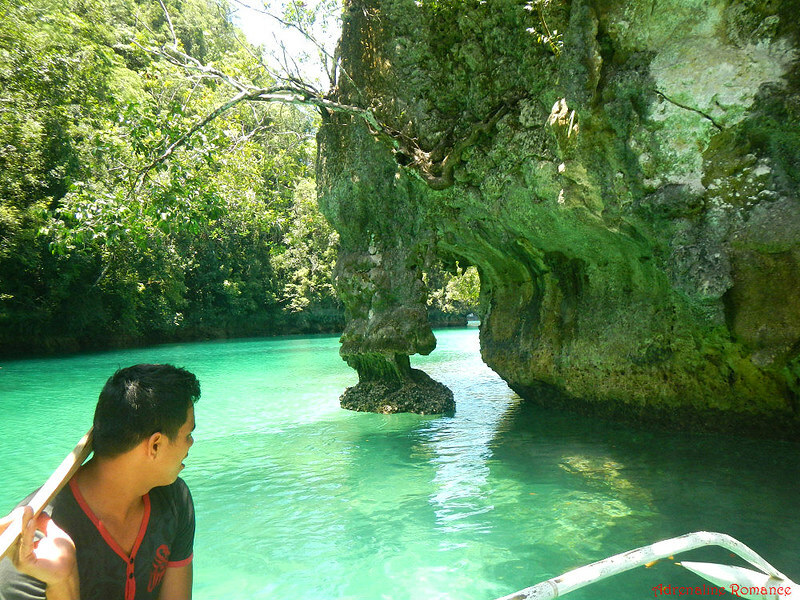 One of those wonders is the Sohoton Cove in Bucas Grande, Surigao del Norte. This mysterious cove—which we think is a dwelling place of sirens, nymphs, and sylphs—can only be accessed in certain conditions. Let’s tell you our story. 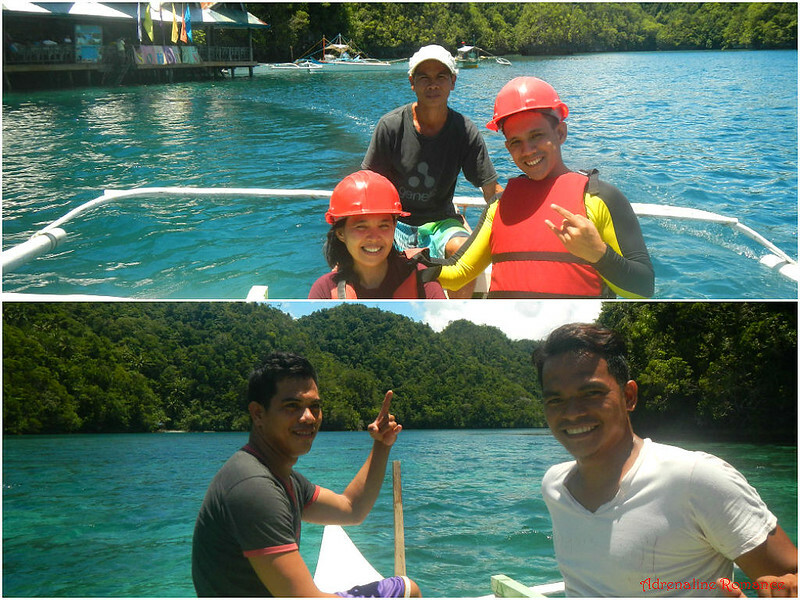 After visiting Lake Tiktikan, Crystal Cave, and Bolitas Cave, we cruised to another part of Sohoton Bay. 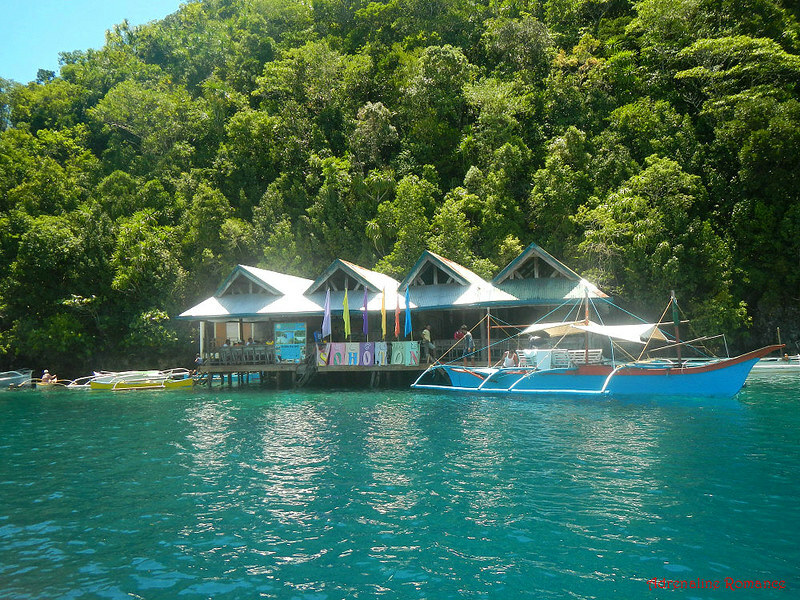 In a few minutes, we arrived at the Sohoton Cove tourist registration center. The Community Service Group of Gyeongsang National University in South Korea had a huge part in renovating this building. 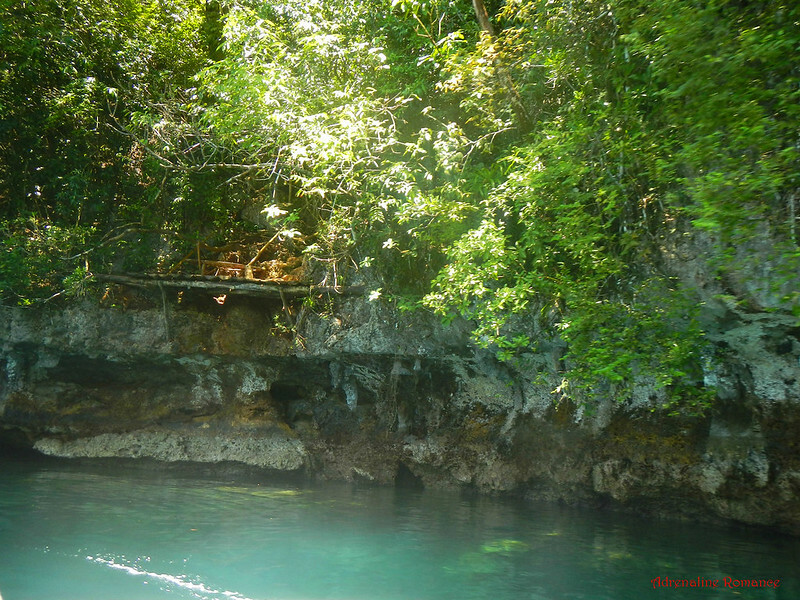 Before entering the Sohoton Cove National Park, visitors must make a stop here. We needed to register and pay some fees to enter the secret cove. 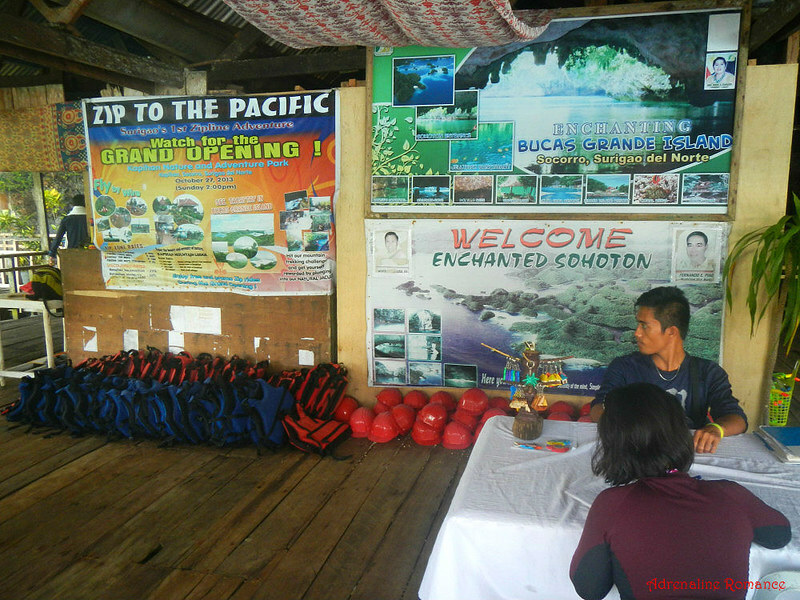 Tarps that provide useful information about the attractions of Sohoton Bay are hung all around. As you can see, this simple tourist center on stilts also provides helmets and life jackets; these are needed for safety. After all, the cove is somewhat deep, and guests are expected to participate in caving activities. After paying the fees, we waited for a few minutes for our number to be called. 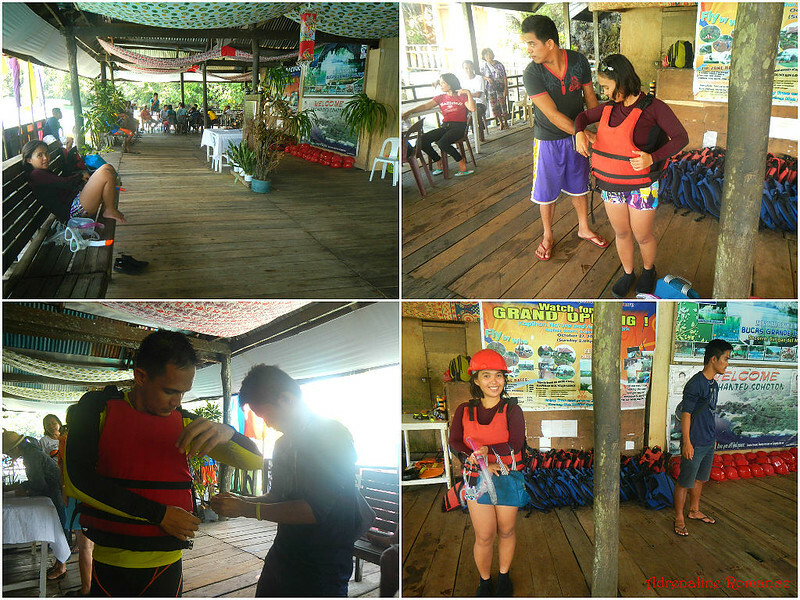 Once our turn was up, we donned safety gear and got our masks and snorkels from our boat. 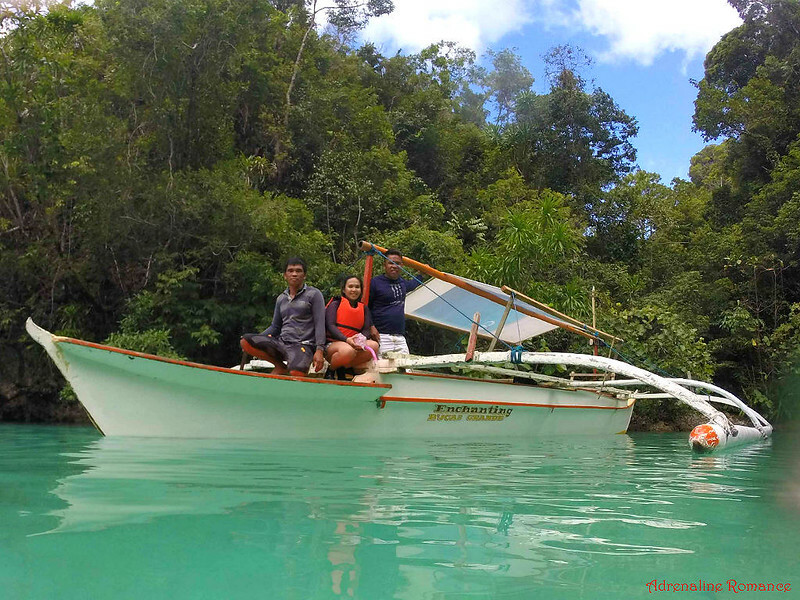 We boarded a much smaller outrigger to take us to Sohoton Cove National Park. But the size of the boat didn’t give us butterflies in our stomachs. We felt really safe as we had two friendly guides and a skilled boatman! Whoa! That’s 3 professionals for the two of us! On our way to the secret cove, we were simply amazed on just how well protected and preserved this area is. Just look at those islets! They are all covered with healthy green trees! The local tourism and DENR offices really did an exceptional job. Additionally, there was not one single piece of litter floating in the water. Around 10 to 15 minutes into the smooth ride, we reached shallow water, and our small boat slowed down. Our quirky guides then turned toward us and made us guess. Where’s the entrance to Sohoton Cove? Well, can you, dear reader, find it by looking at the photo below? If not, don’t fret. We were actually there, but we weren’t able to find it for quite some time. The place’s namesake comes from the Cebuano word so-oton which means to pass through a small opening. To enter the Sohoton Cove National Park, we need to pass through this one and only opening—a wide tunnel cave with a very low ceiling. 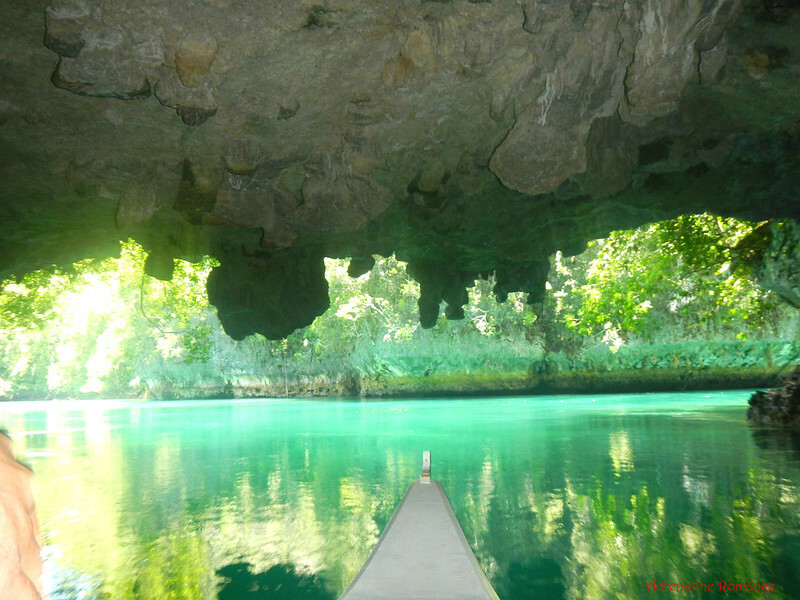 This cavern—and subsequently, Sohoton Cove—is only accessible when the tide is low. 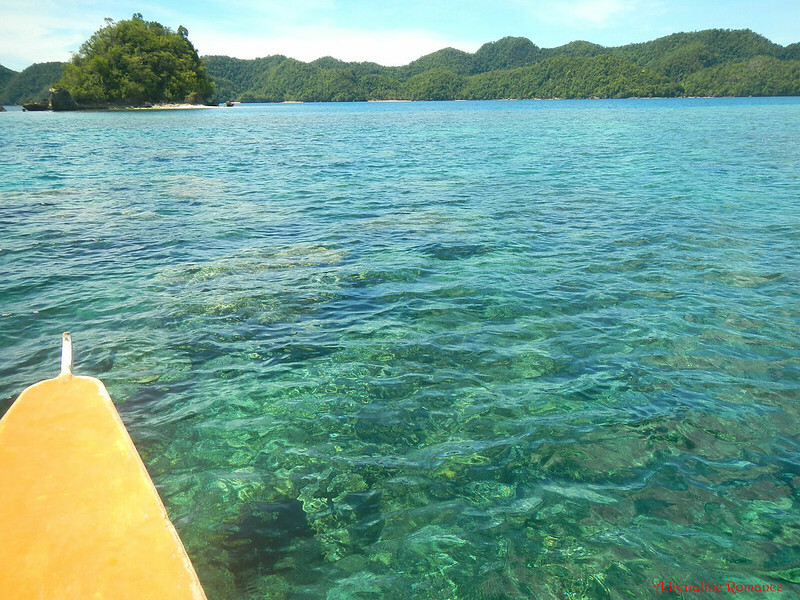 That’s why we first visited other attractions in Sohoton Bay; we waited for the tide to subside. 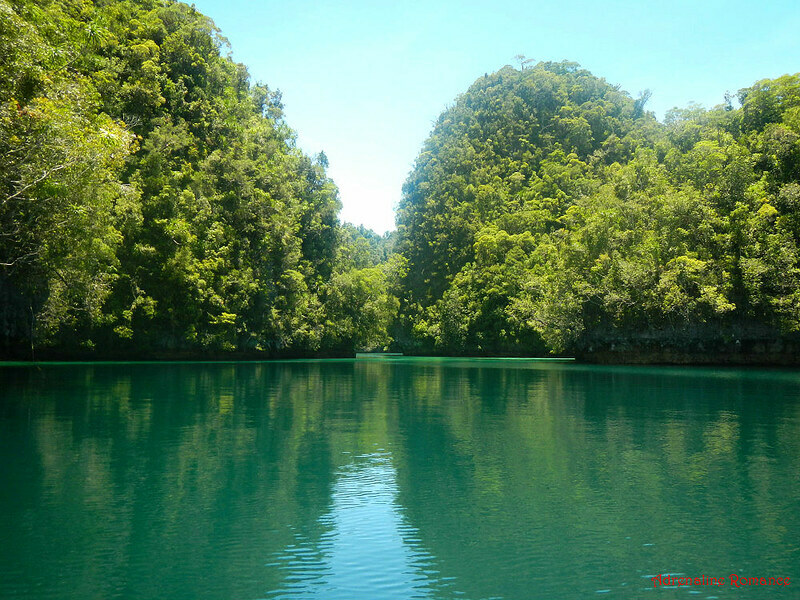 Mere words and photos can’t describe the grandeur and captivating beauty of Sohoton Cove National Park. You have to be there to truly experience its majesty and magic. It was like entering into the realm of mermaids and sea nymphs. We cruised along what seemed to be like a gigantic lagoon filled with numerous islets, listened and entered a “snoring” cave, and dived off a cliff. Hopefully, dear readers, the video below will give you an infinitesimal sense of the splendor of this secret place. Wow! That was definitely something, wasn’t it? 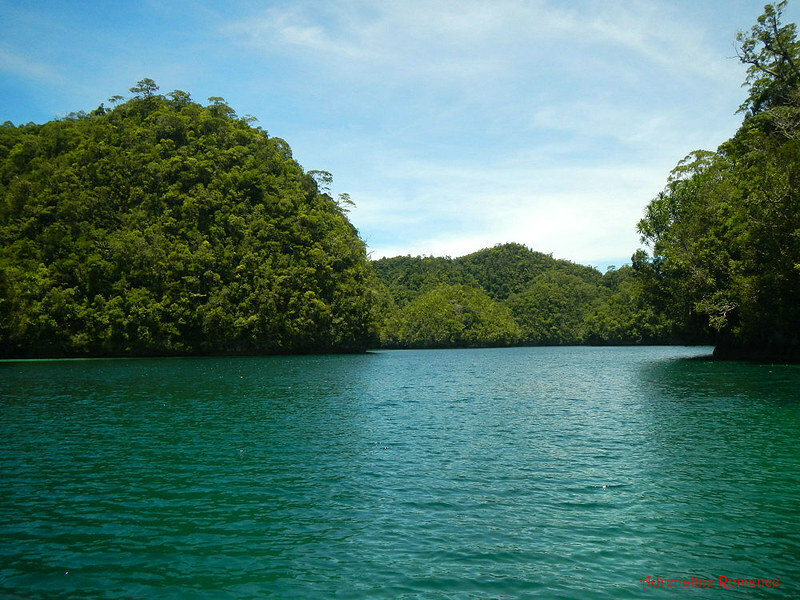 Now, let us show you a few more interesting things in Sohoton Cove. Almost immediately after entering the cove, we saw this interesting, odd-shaped rock formation. The guides call this Ti-il sa Kabayo (some call it Ikog sa Kabayo), which translates to horse’s feet (or horse’s tail) because it is shaped similarly to those parts of a horse’s anatomy. 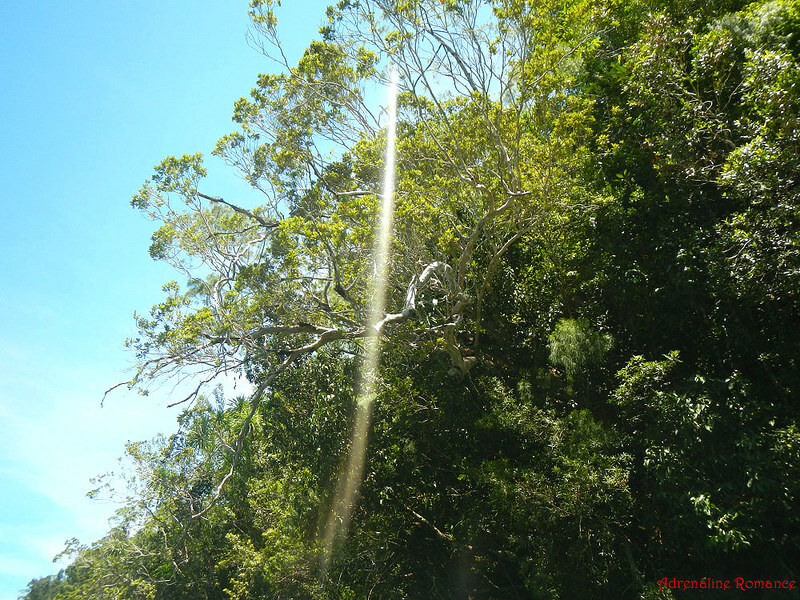 This is a very important landmark in Sohoton Cove; you shall soon learn why it is so. We also found this odd-shaped, moss-covered stalactites jutting out of sea cliffs. Those white branches are actually the arms of a petrified tree. After being exposed to the sea’s elements, the tree has become as hard as stone. That’s a beautiful limestone cliff! Deep water soloing, anyone? Uhm—nope. The water right at the base of the cliff is too shallow. But for us, rock climbers, the cliff is spectacular nonetheless. The guides had a name for this cliff face, but we forgot to take note of it. Bummer! 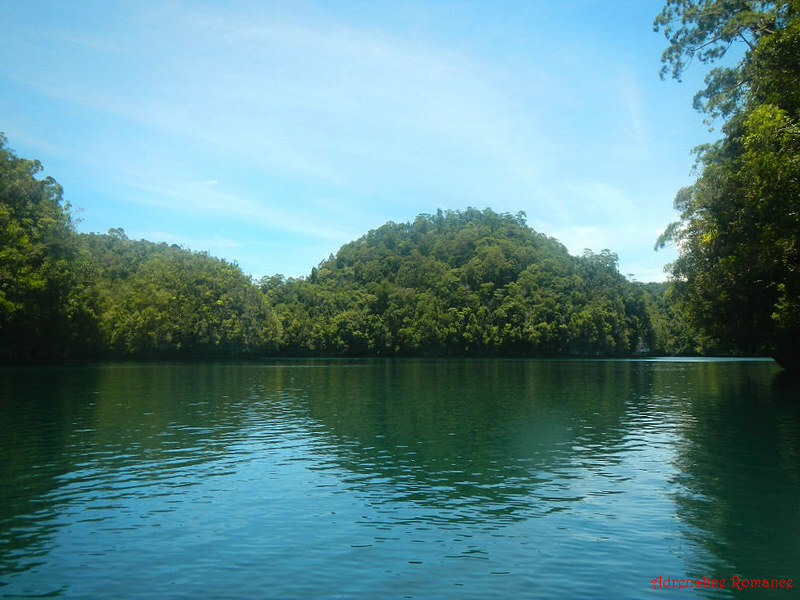 Sohoton Cove National Park is filled with these gorgeous, muffin-shaped, forest covered islets. Most of them are untouched by human hands. 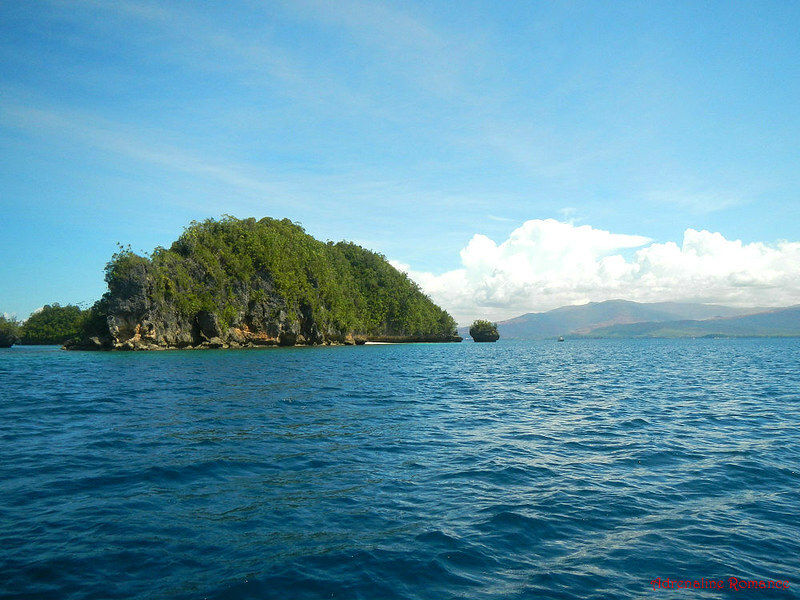 We won’t be surprised if there are rare and never-seen-before species of flora and fauna residing in these islets. The waterways and the islands inside the cove are so similar in appearance that once inside the cove, it is virtually impossible for guests to know where the entrance/exit is. Yes, you can definitely become hopelessly lost here! And if, unfortunately, the tide is high while you’re still in the cove, you could be trapped here (cue Blair Witch music). Fortunately, we have trustworthy and experienced guides who are very familiar with the place. By the way, we did say earlier that the Ti-il/Ikog sa Kabayo was an important landmark, right? Well, guides use this landmark as reference; when they see the rock formation, it means they are near the entrance/exit of the Cove. 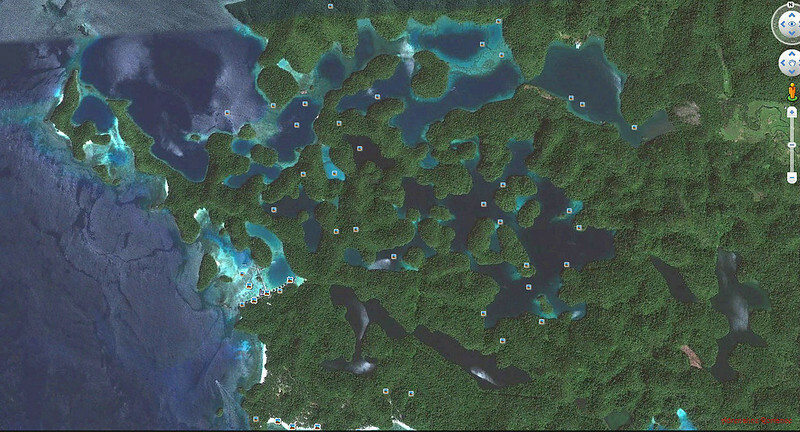 Here’s a Google Earth satellite photo of Sohoton Cove National Park. As you can see, it’s like a gigantic, natural maze! Our first stop inside the National Park is Hagukan Cave, literally snoring cave, due to the fact that it makes an ominous snoring sound as the waves of the receding tide lap the cavern’s roof. The air from the cavern rushes out in pulses in sync with the waves, creating the snoring sound. It’s like listening to a sleeping giant. 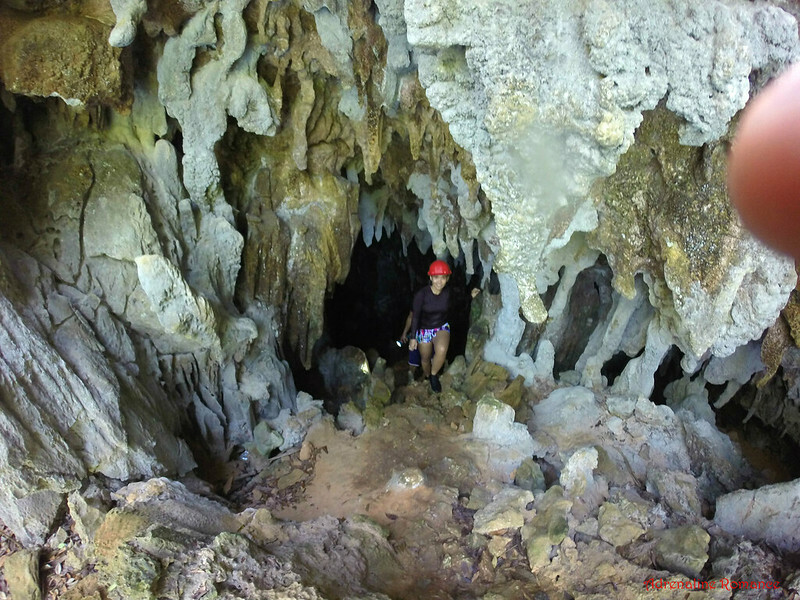 According to the guides, we were lucky that we were able to listen to Hagukan Cave’s sounds. The snoring sounds are generated only during a specific period of the tide’s recession. In fact, the group that followed us weren’t able to hear the sounds anymore. 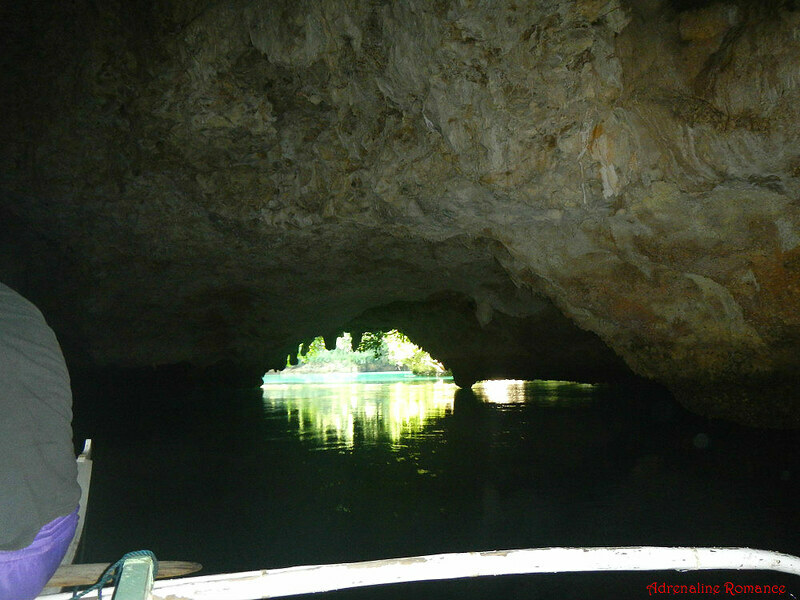 Yes, we entered Hagukan Cave by swimming inside it. Inside, the cavern was lit with an eerie glow. Check out the first video in this post for a view of the interior of Hagukan Cave. It starts at 1:14 and ends at 1:47. 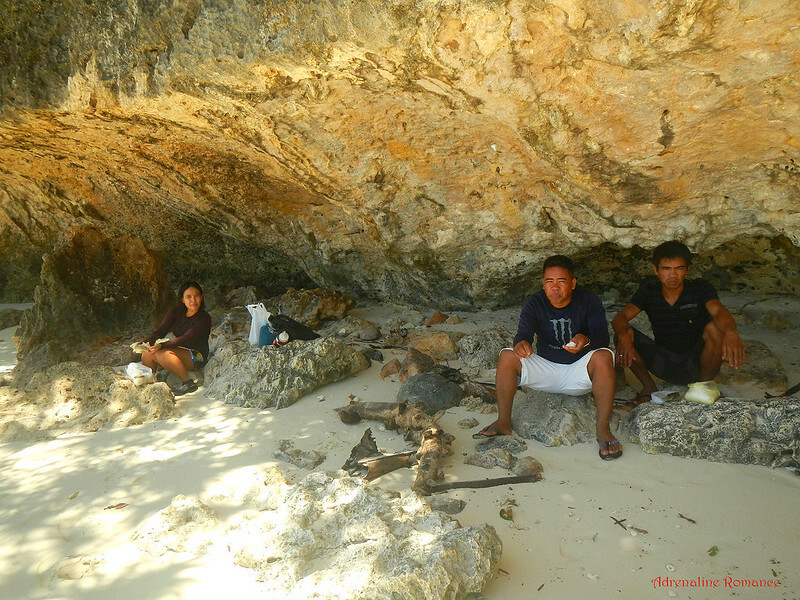 After exiting Hagukan Cave, we went to our second destination in the cove. After a 15-minute ride, we arrived at our next adventure venue. Wait, is that a platform stuck in the middle of a cliff? Yes, it is! And that is actually the exit! This is the entrance of Magkokoob Cave where we had to wade on waist-deep water. Inside was a collection of splendid stalactites and rock formations with the sound of lapping waves and dripping water in the background. Again, check out the first video for a better view inside Magkokoob Cave. It starts at 1:48 and ends at 2:27. To exit Magkokoob Cave, we had to scramble up a very steep, slippery, stalagmite-filled path. It’s just a short climb, however; and the view from the exit, with all those stalactites and stalagmites, is totally amazing. The shortest, most exciting way to exit Magkokoob Cave is to dive 15 feet from that platform. That’s the view from the diving platform. Beautiful, isn’t it? The other alternative is to go back to the cave’s entrance. But we needed a bit of adrenaline rush so—dive, it is! On our way back, we chanced upon a number of large fruit bats flying around the cove. These are probably the same types of fruit bats that we saw in Mambukal Resort in Murcia, Negros Occidental. 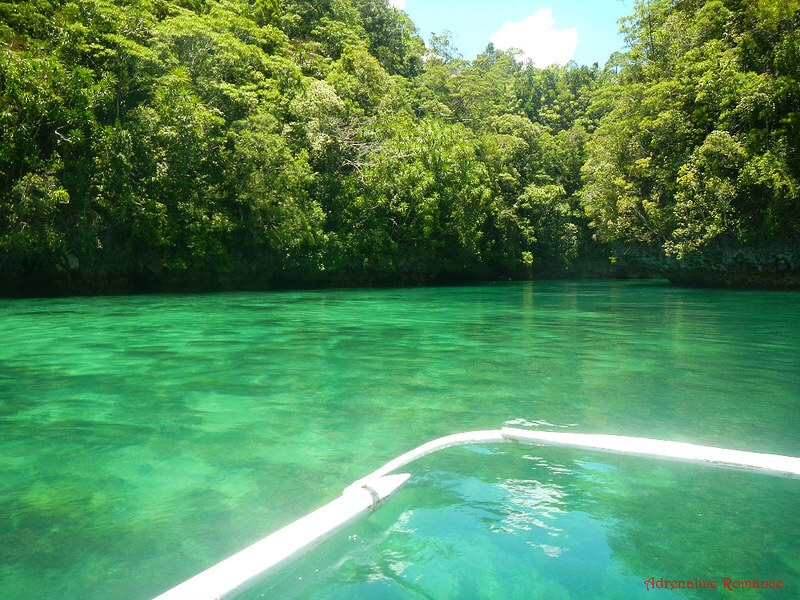 There is still another attraction in Sohoton Cove, which is the jellyfish sanctuary at Tojoman Lagoon. However, since we already swam with jellyfish at Isla Noah, we didn’t go to Tojoman Lagoon. 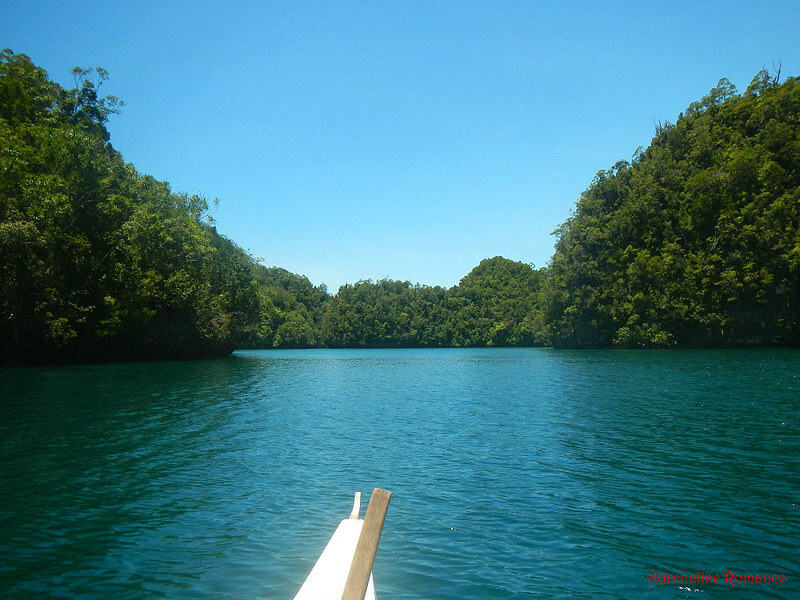 After more than two hours in the Sohoton Cove National Park, we exited back the way we entered with happy smiles, sparkling eyes, and refreshed spirits as well as a renewed appreciation of Mother Nature. In less than half an hour, we were back in the registration center. Look at how narrow our boat is! But don’t worry, it’s a perfectly safe vessel. After re-boarding Sir Vincent’s bigger boat, we left the tourist center to head back to Socorro. But before that, we have two more cool-down activities. On our way to our next destination, we passed by this deep-water section of the cove. See those white splotches at the bottom of the green hills? Those are secluded white-sand, uninhabited beaches. First cool down activity was lunch—lunch by the beach, of course! 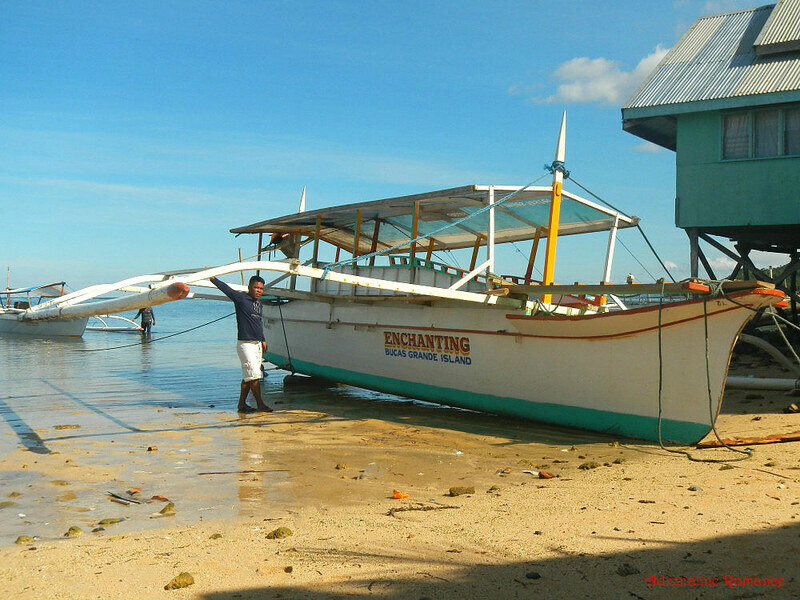 We docked at Marka-A Beach, a popular but small and remote white-sand beach. We would definitely want to have lunch in sandy paradises like Marka-A Beach! Those overhanging cliffs provide a nice shady nook for us to gobble down our packed lunches. That’s the magnificent view from our lunch table. Wow! 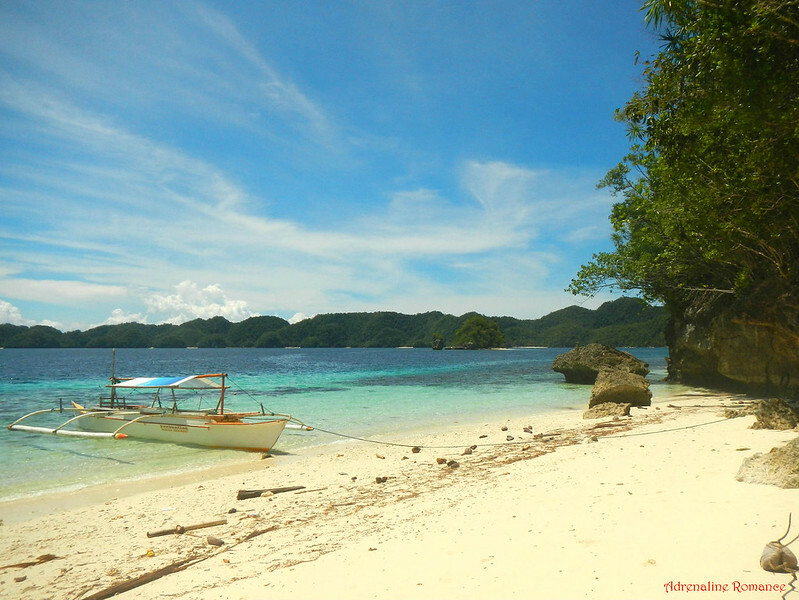 We, Filipinos, are actually fortunate to have numerous and lovely tropical paradises like these. This is just one of our playgrounds out there—peaceful, quiet, cool, and relaxing. That’s the other side of pristine Marka-A beach. Beyond that is the ugly, deforested open-mine pit in the municipality of Carrascal in Surigao del Sur. What a sharp contrast! Of course, Sweetie and I can’t resist the rock’s calling. 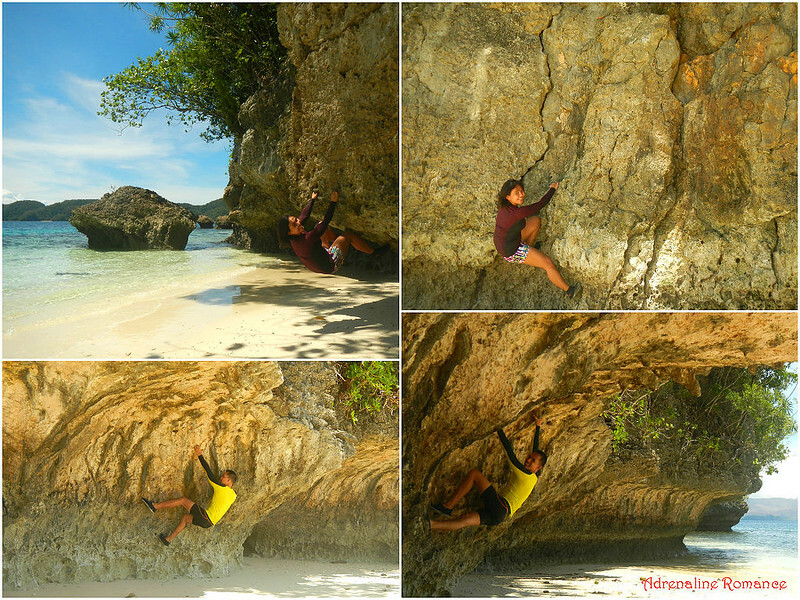 We didn’t bring rock climbing shoes, chalk bags, and bouldering pads but—well—what the heck! Our aqua shoes and our hands will have to do. An hour later, we left Marka-A beach (which became hotter every minute) and cruised to a nearby area of shallow water. 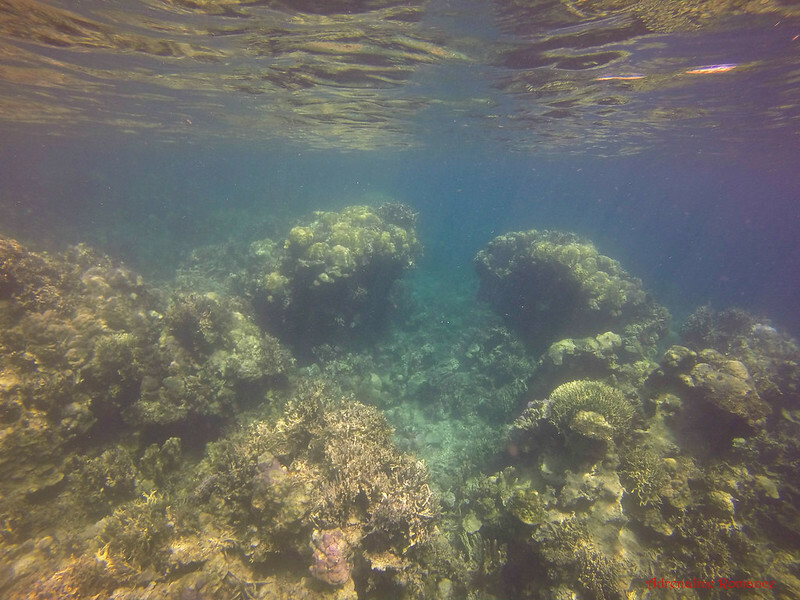 It was so clear that we can actually see the coral beds under us. It was time for our number 2 cool-off activity—snorkeling! Excited, we donned on our snorkel gear and jumped in the water. Sir Vincent cautioned us about the slightly strong current in the area so we wore our life vests. 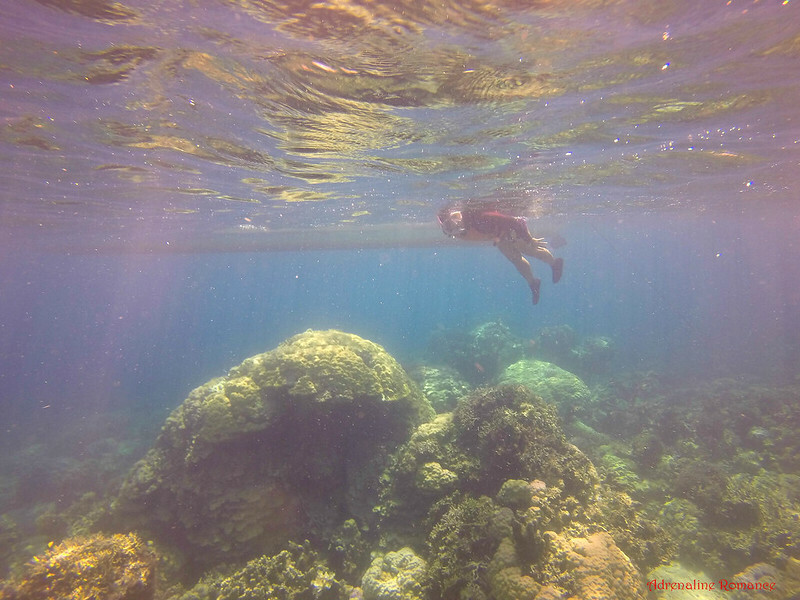 Pardon us for the strong red tinge in our snorkeling photos. You see, we recently acquired a GoPro Hero Plus camera, and we still don’t know how the shots would look underwater. To avoid a bluish or greenish tinge, we placed a red filter over the lens. Unfortunately, after seeing our snorkeling photos, we discovered that the red filter only works effectively in deep water. In shallow water, the daylight is still sufficient, so the filter is unnecessary. 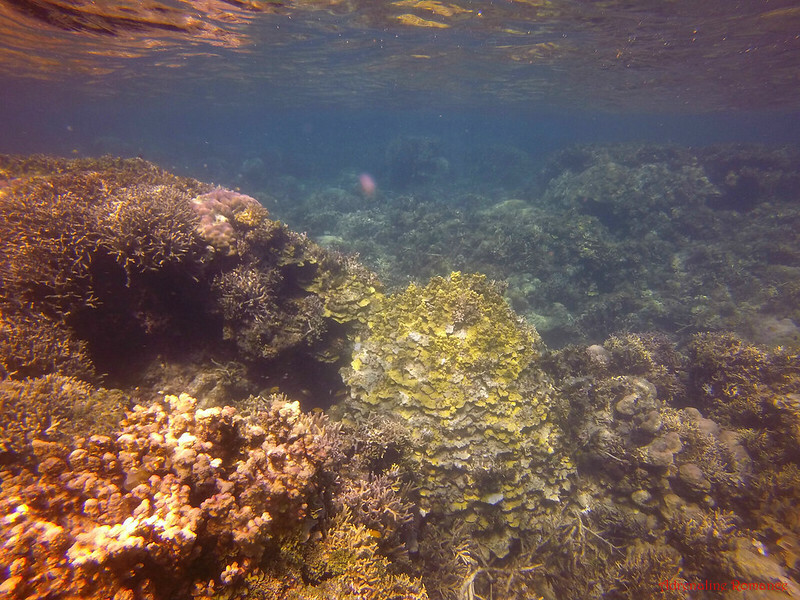 They look bland and dull due to the red filter, but the corals here are actually vibrant. This is a snorkeler’s haven. Check out that coral encrusted rock! 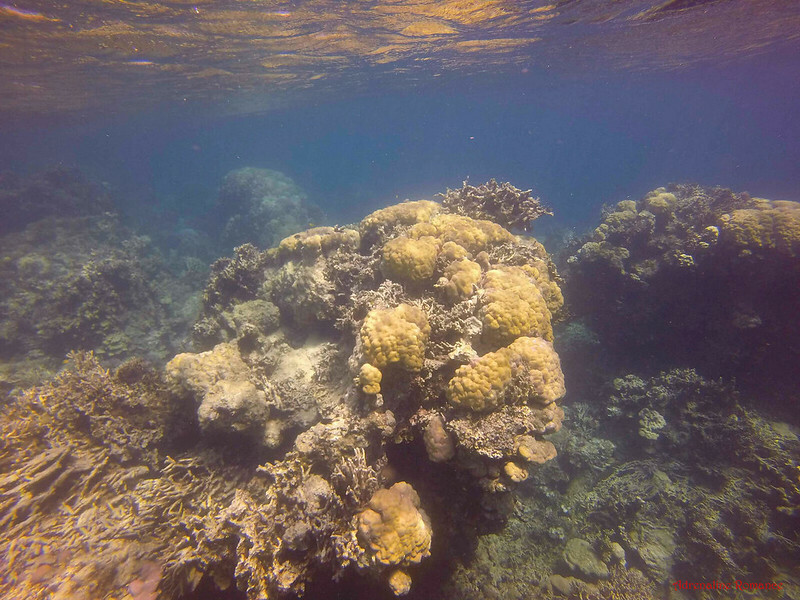 Surprisingly, there weren’t too many fish here despite the rich spread of live and lush corals. Perhaps they’re hiding because we intruded in their domain? Beautiful coral gardens but still not a lot of fish. Huhuhu! They’ll probably get out of their hiding places at night. Hmmm, maybe we should have a PADI Night Diver’s license, Sweetie? After we had enough of snorkeling, it was time to cruise back to Socorro. We sat silently in the boat while admiring the rock formations and sea cliffs that we passed by. Half past three in the afternoon, we finally docked in Socorro. Sir Vincent proudly showed us his much bigger second boat. Sir Vincent had some minor business to do in a village a few miles from Socorro. Seeing the opportunity for an inland tour, we asked him if we could tag along. He happily agreed, and we had a bonus tour! 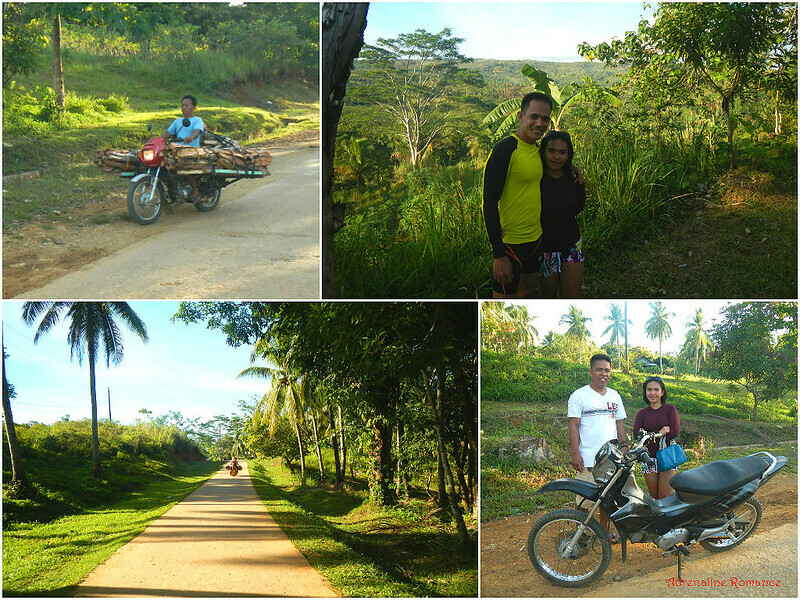 During the motorcycle ride, we witnessed lofty hills, lush valleys, and checkered farmlands. We witnessed fully loaded Skylabs! Most importantly, we saw happy kids, laughing moms, pipe-smoking farmers, and other joyful snippets of rural life. We would like to give a huge thanks to Sir Vincent and his sidekick for being super friendly, knowledgeable, and exceptional guides. In fact, they are some of the best guides we’ve ever met. 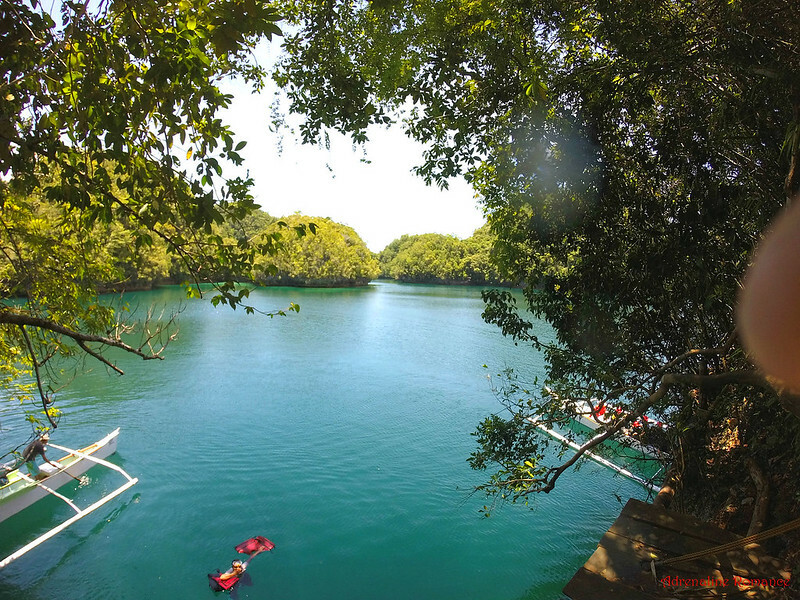 Truly, we can say that Bucas Grande is paradise on earth! But, no, it’s not just your ordinary postcard-perfect tropical paradise. Bucas Grande is something else; there’s something delightfully otherworldly with its silence, tranquility, remoteness, and plethora of wonders. The photos and videos in this series are simply pale representations of the enchantment of this place; you have to be there. Experience the magic, and visit Bucas Grande! * Except where indicated, all rates are on a per-person basis. We did not include our expense for meals, snacks, souvenirs, tips, and other fees in this rate sheet as you may have different needs, preferences, itineraries, miscellaneous transportation, and sharing scheme from us. Prices may change without prior notification. 1. To ensure a hassle-free booking, book your tour directly with the Socorro Tourism Office. They will be the ones who will arrange your boat and guide for you. 2. When arranging with the Socorro Tourism Office, try to ask for Mr. Vincent Tamayo as your boatman and guide. He is truly exceptional, and he will make your tour worthwhile. Contact details may change without prior notice. 3. 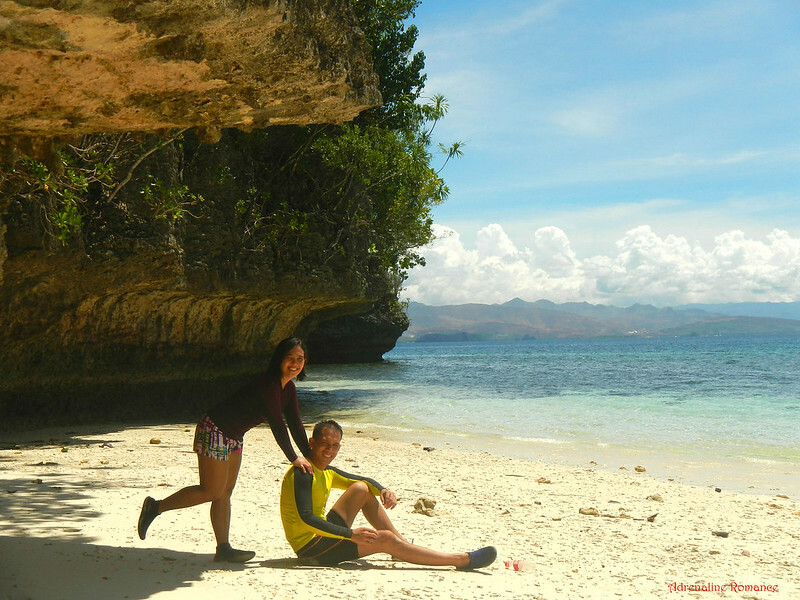 Note that the price of the Sohoton Bay and Dagatan island hopping adventure does not include the fees for the Sohoton Cove National Park Tour. Please check the prices above. 4. 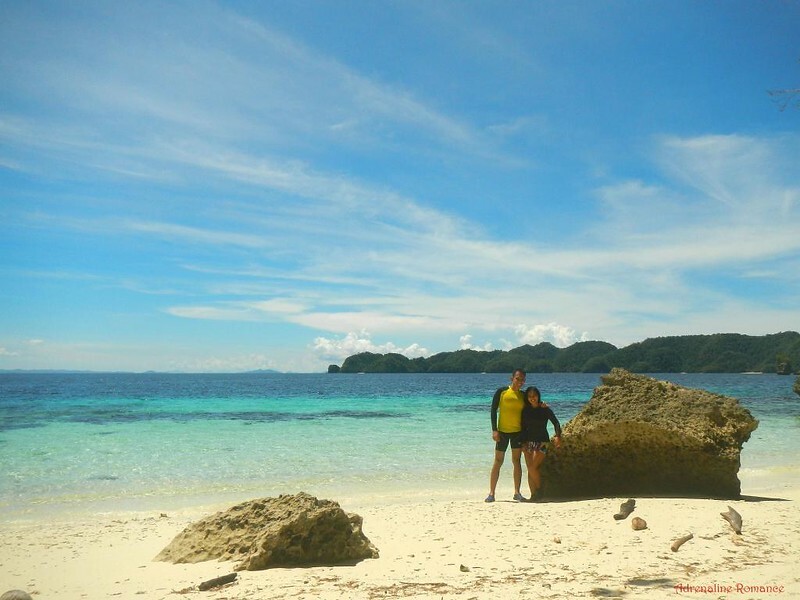 For a more relaxing and unhurried adventure, we recommend staying one night in Socorro then enjoying your island hopping and Sohoton Cove tour the next morning. 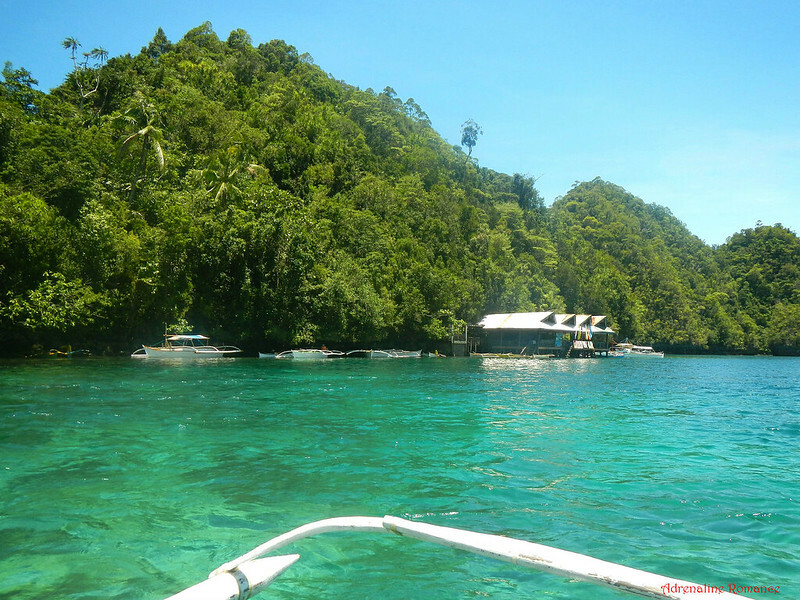 Accommodations in Socorro are cheaper than those of the high-class resorts around Sohoton Bay. 5. 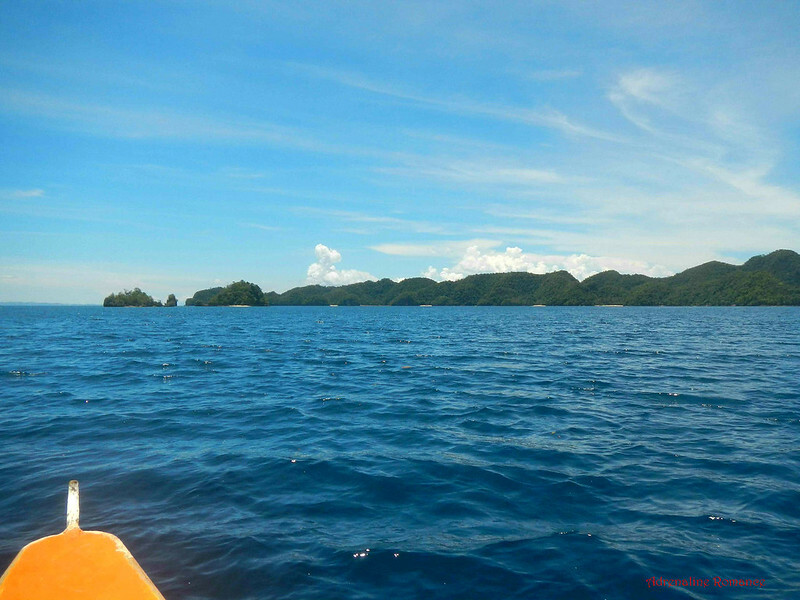 It’s also better to start your Sohoton Bay adventure in the morning when the sea around Bucas Grande is calm and smooth. It gets choppy and rough in the afternoon. 6. Note that the resorts in Sohoton Bay are virtually isolated from Socorro. Thus, if you wish to stay in these resorts, expect loss (or even absence) of electric power, shortage of fresh water, very limited menu, etc. It is best to arrange everything—from transportation to meals—with the resort you wish to book in beforehand. 7. 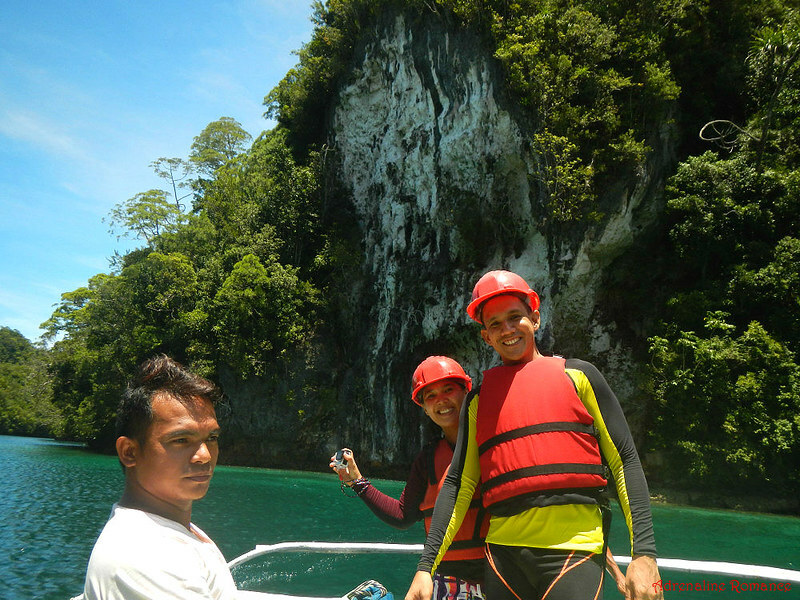 For safety, always wear your life vest, especially when you are cruising over deep water or inside Hagukan Cave. 8. Pack light but do bring the following in your backpack. 9. Waterproof your stuff. 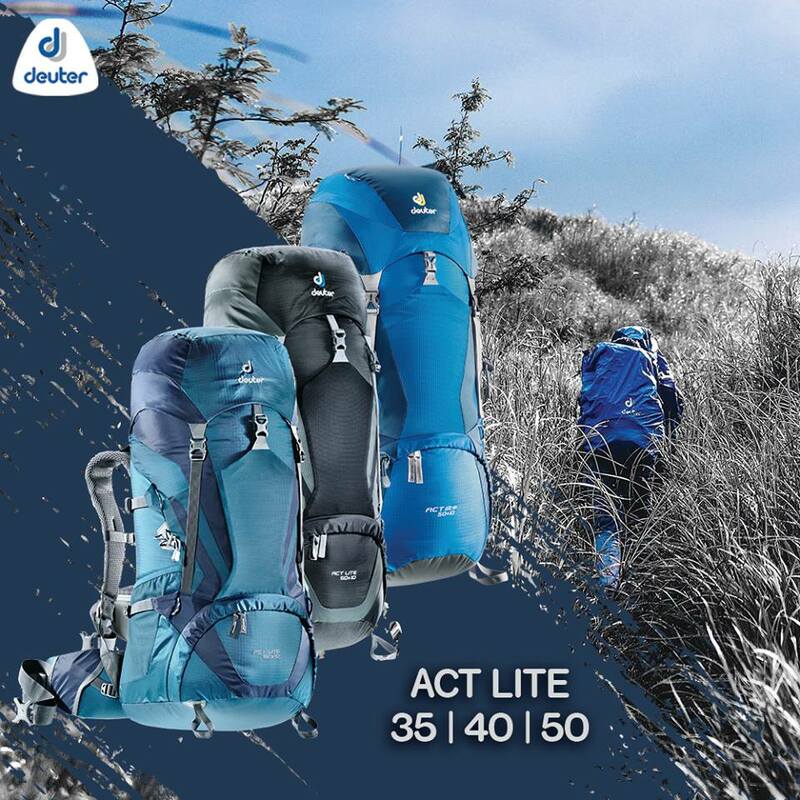 Place your stuff in dry bags or dry sacks such as those manufactured by Sea to Summit. You can buy top-quality quality dry bags and dry sacks at Sea to Summit at the 2nd Floor Northwing of SM City Cebu. Thanks a lot for your reply. Btw, will there be a boat large enough to accommodate 20 passengers? Or do we go by small group (4-6 persons per family) in small boats? What do you recommend as “musts” to visit given the fact that we have kids in our party plus we plan to leave right after lunch to avoid the rough sea? We suggest you get in touch or visit the tourism office in Socorro (contact details in this blog post) so they can arrange a large boat. Also, our guide Vincent has a bigger boat that can accommodate a group of people (see the third from the last photo). 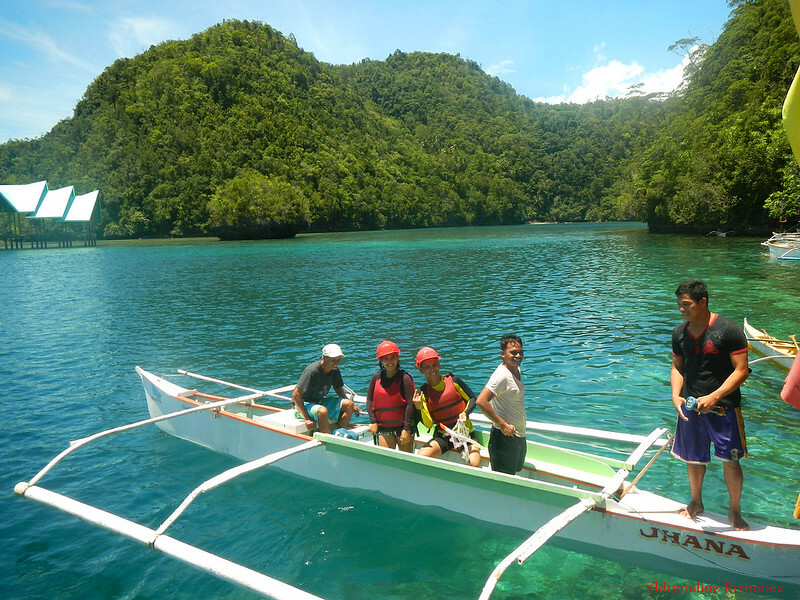 At the visitor’s center before entering Sohoton Cove, you will be transferred to smaller boats; big vessels can’t fit inside the cove’s entrance. 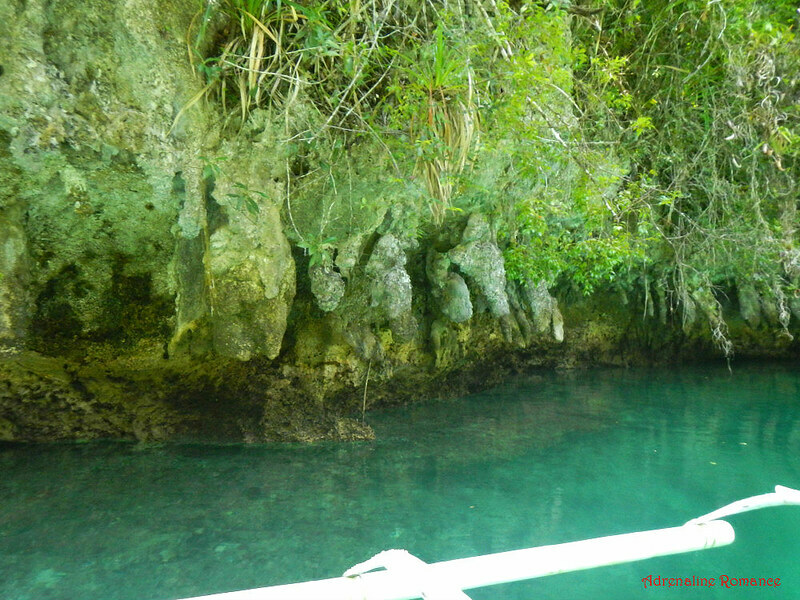 Thus, you will be divided into smaller groups when entering Sohoton Cove. Outrigger boats are very stable, and you will be sailing along the coast so you don’t need to be afraid of rough seas. Just let your kids wear life jackets as a precaution. Hope this helps. 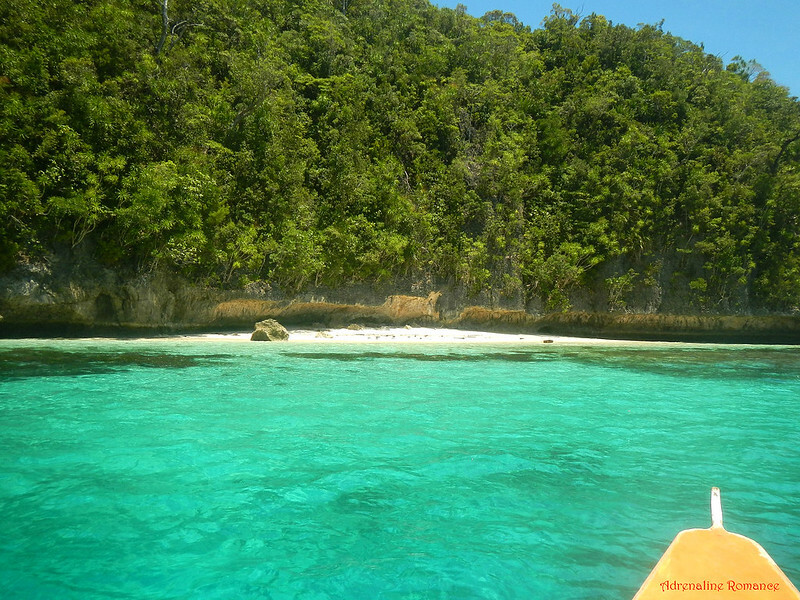 Hi Janica , this is Ryan from Cinnamon Island, yeah absolutely there’s a boat that can cater for up to 20 passengers or even more, and @Adrenaline is right “you will be divided into smaller groups when entering Sohoton Cove, 8 pax /boat. Hi! Your replies will definitely be of great help to us. Maraming salamat ad God bless. You’re welcome. We’re glad to be of help. Just make sure you get in touch or visit the tourism office in Socorro to make everything easier. Can I bring my 2 year old son there? 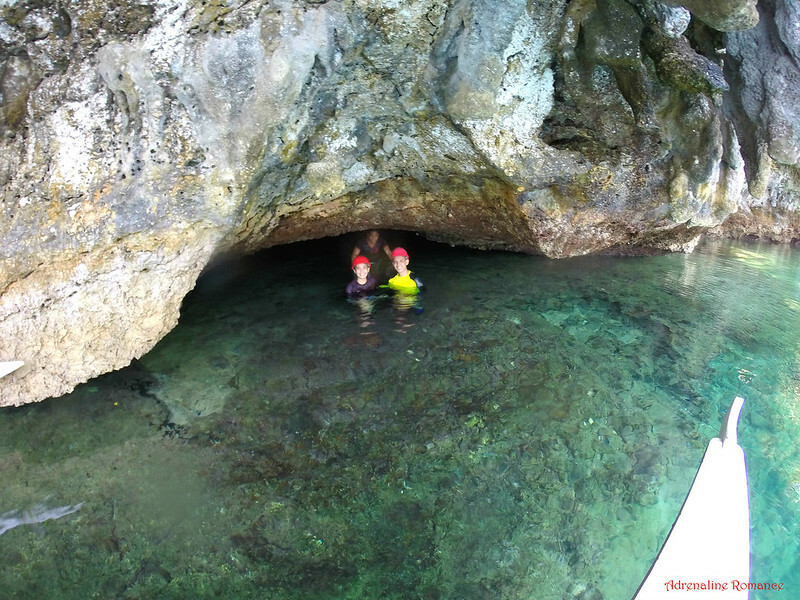 The Sohoton Cove is safe for young kids. But we are not really sure if they would allow kids as young as 2 years. old. It’s better if you ask the tourism office there. Sure, Alpha Mae. What is your inquiry? We’ll try our best to answer it. hi po. Magkano po ang rent ng boat for 10-15 pax?. The rates are in the blog. Please read the blog in its entirety. Thank you. OMG…SO JEALOUS! Love both your seats for life and adventure! Plus, you throw a little education in there with it…Luv It!